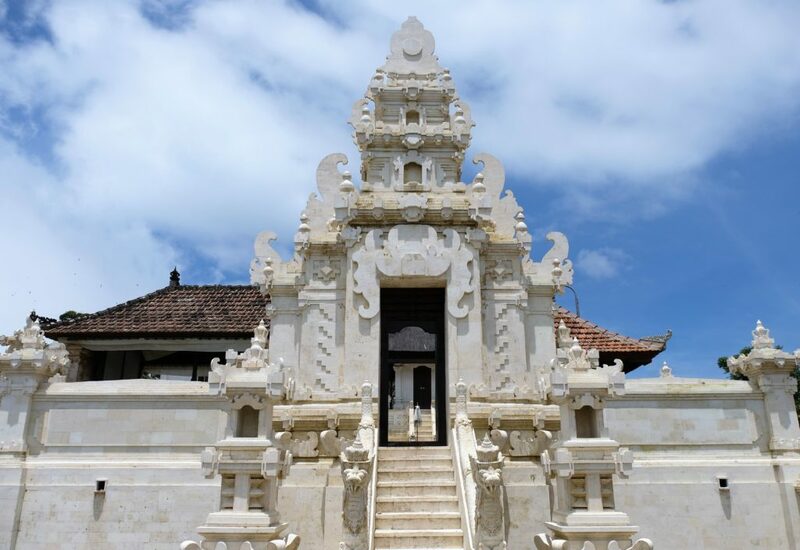 A little preface to my time in Bali, Amed Beach and my visits to Pura Penataran Agung Lempuyang and the Water Palace (Tirta Gangga)…my arrival at Ngurah Rai Intenational Airport in Bali. Nothing bad, just one of those experiences that was bound to happen at some or other time. I thought Malaysia had a reputation for being strict at the border, seems Indonesia is even more so; especially if you read about people being caught with drugs, no I didn’t bring any 😊. Though the people I met in Indonesia and at the airport were all friendly, I’ve never been so thoroughly searched, ever! Everything was taken out of my bag, and I mean everything; my vitamins were taken for testing, my toothpaste was open, the soles of my shoes were removed, every single piece of clothing was checked every container was opened. The whole process took over an hour…made me start to think just how genuine the vitamins I bought in Kuala Lumpur! Airport check aside, the gentleman was very friendly and all in all I think I’m a very lucky traveller. My delay at the airport got me to my hotel (Puri Dibia Hotel & Restaurant) after dark, I only planned to be there for 3 nights. My accommodation was ok at best, it served its purpose and is only a short walk to the main Kuta beach. Surprisingly, I don’t have much to say about Pantai Kuta and the surrounding area. Why? Well, honestly, I was disappointed, the place is as Western as you could possibly imagine with malls and hotels along the main beach. The beach, dirty and without exaggeration one of the worst beaches I had been to in years. It was so bad I didn’t even go for a swim. I tried my best to find nice places, but I may as well have been in London. After 1 day of aimlessly walking about I knew I had to leave, even giving the second day a wholehearted effort…no joy! What do you do if you don’t like a place…go somewhere else, and that’s exactly what I did, Amed Beach here I come! I was a little concerned going to Amed Beach, I had heard great things about Bali, if Amed Beach was anything like the Kuta beach, then my plans for Indonesia would need to be drastically rethought! No need for concern, Amed Beach was a saving grace! Located on the West side of Bali, Amed beach is 100km from Kuta beach, so not far away. Yet, with the narrow roads in addition to the locals preparing for a religious holiday it took just over 3 hours to get to my accommodation right on Amed Beach, Hotel Uyah Amed & Spa Resort. I have no pictures of the resort nor the ride to Amed Beach, I took pictures, but have no idea where or what I’ve done with them, I must have deleted them by accident! GRRRRR! With a rather grandiose name it isn’t what I would classify a “spa”; they do offer massages, so many accommodations do. It’s a nice place, a higher standard compared your usual run of the mill compared to others within the area. It has two swimming pools and a restaurant, with single story accommodation (there are no big hotels here, a double story sticks out) and right on the beach. You can take a look at their website if you want a better idea. I suppose what really counts is they are very friendly, the place was one of the cleanest I had been to for “beach accommodation”…I definitely go there again. Enough about the accommodation, why I went off on a tangent I don’t know. Amed Beach is remote, in the past three years they got their first ATM/Cash Point, they now have two; they don’t work all the time but normally at least one is working, there are no banks and there is one convenient store. The rest of the town is little hostels, hotels, homestays, restaurants and diving schools – it’s a very cool little town. Now for the caveat, I didn’t have the best of weather. There were a few thunderstorms, which I love, the negative par it is that they made the water very murky with visibility at 2m so snorkelling was useless. Not being able to snorkel was a downer considering there are amazing (apparently) coral reefs and marine life – I was told the coral is much better than Thailand! Another GRRRRR!!!! Oh well, a great reason to go back! 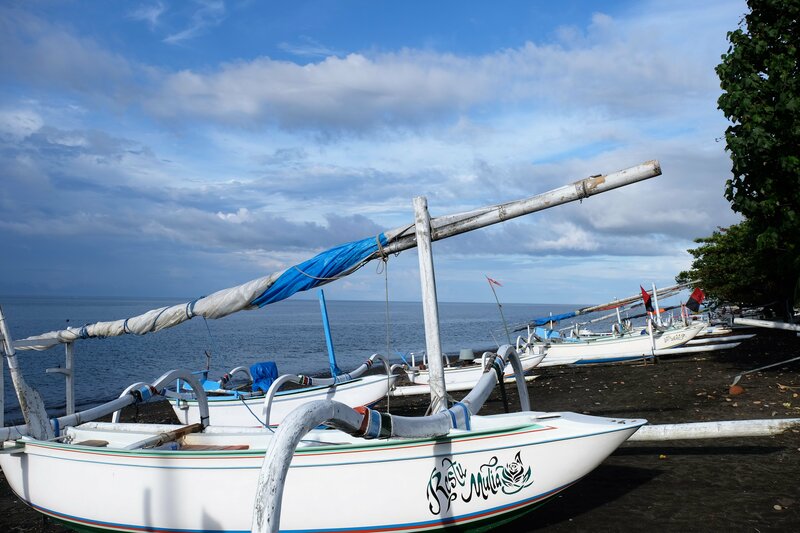 One of the trademarks of this side of Bali is the black sand beach. Over thousands of years the volcanic rock has been worn away by the sea, leaving behind a black coarse sand. The black sand makes the beach look dirty, it isn’t, the contrast between the sea shells, sea weed/plants against a black backdrop makes things stand out – one of the cleanest beaches I have see in some time. 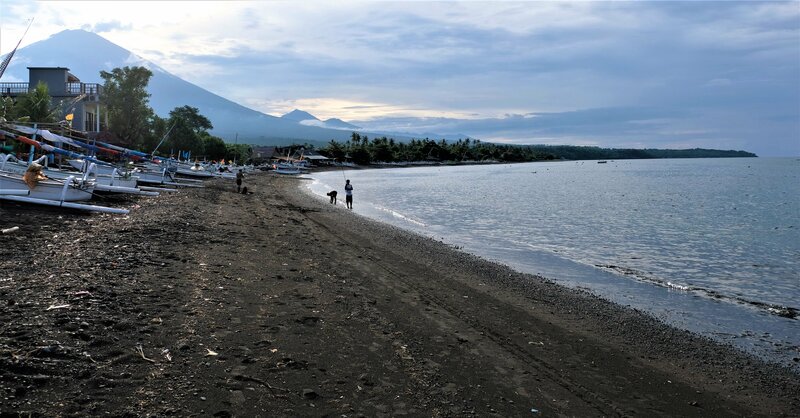 Standing on the beach and turning to your left, the pimple like mountain of Agung lurks in the distance, an active volcano. It is possible to climb the volcano, my luck, it had been rumbling recently so was closed for hiking. I enquired about climbing up unguided and was told the police would chase me and arrest me…..neah, a night in jail wasn’t that appealing to me. Along with my photos from the drive between Kuta and Amed Beach I seem to have “misplaced” some other pictures of Amed Beach Town, if you can call it a town. I’ve looked everywhere and don’t know what the hell I’ve done with them!!! The only pictures I have is a few of the beach right by my accommodation and part of a religious ceremony. It looked like everyone from the town brought food to the local shrine on the side of the main road through the town – a single lane road. Everyone was dress-up in their regalia with the sermon (guess that’s what you call it) being conducted on the closed off road. After the ceremony it looked like everyone took back the food and headed back home, leaving the shrine adorned with flowers and a little foot spread out at the base. Such a pity I can’t find the bloody photos! 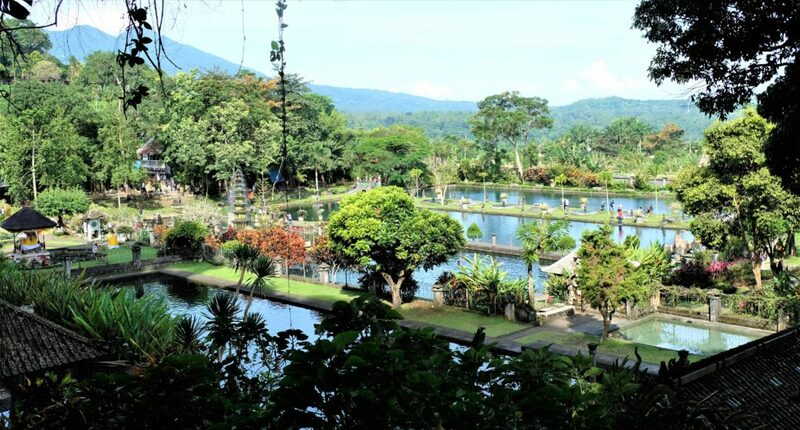 I took a day trip to Puta Penataran Agung Lempuyang and the Water Palace (Tirta Gangga) (about an hours drive from Amed Beach), part of a temple complex on Mount Lempuyang; the mountain behind my accommodation, with the temple complex on the other side of the mountain. I hadn’t known how significant the temple complex was only till months later (writing this whilst in Munich), especially the temple right at the top, Pura Lempuyang Luhur, I’ll get into that shortly. Pura Penataran Agung Lempuyang is the more well-known temple, partly because of the of white gate wall/pillars, the gate frames Mount Agung in the distance, the temple has beautiful dragon stairs, but I think a big factor for it being more famous is because most people don’t climb all the way up the many, many, many stairs to reach Pura Lempuyang Luhur (the temple at the top). I’ve not been able to find out how old the temple complex is, the only thing I can find (I don’t know how accurate it is either), is that the mountain was used for religious purposes before the Hinduism arrived on the island. 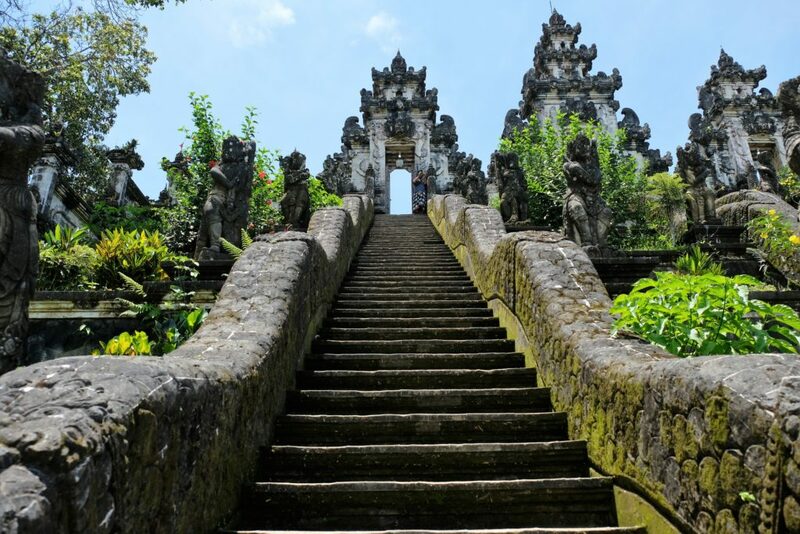 The temples on Mount Lempuyang form part of a greater temple complex around Bali island, these eight temples mark out the cardinal directions. 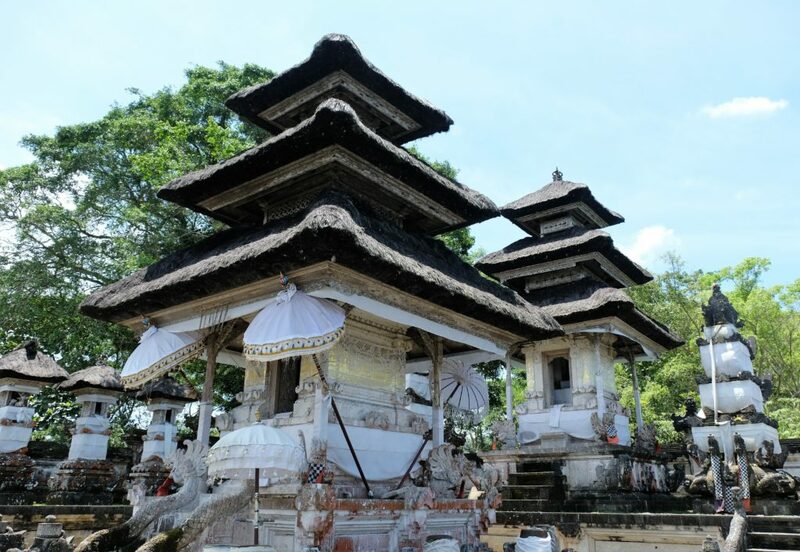 This complex is dedicated to Ida Betara Hyang Iswara, the guardian of the east and forms part of six temples known as Sad Kahyangan Jagad or “six sanctuaries of the world” these are the six holiest places of worship on Bali. 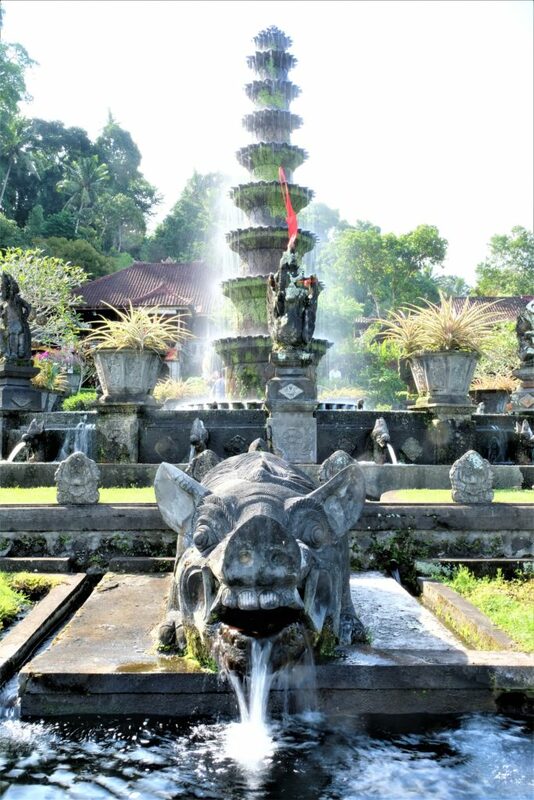 The mountain is divided into three, this is in correlation to Balinese cosmology. With the base known as Sang Anata Bhogo; this corresponds to the mount of Brahma. The middle is known as Sang Naga Basukih; this corresponds to mount Vishnu. Finally, the top is known as Sang Naga Taksaka; this corresponds to mount of Shiva. 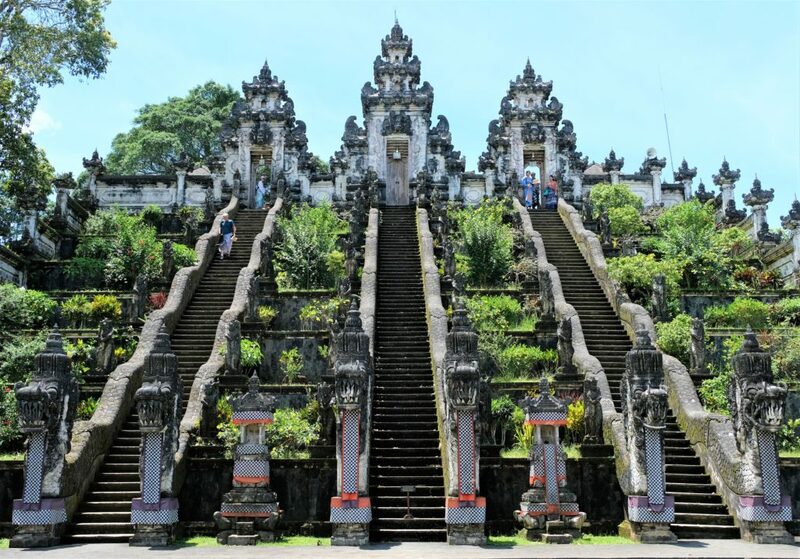 White stairs lead up to a patina white split gateway called a candi bentar from which you enter a large courtyard, already the next set of stair in side; a set of three stairs running parallel with dragons as balustrades. 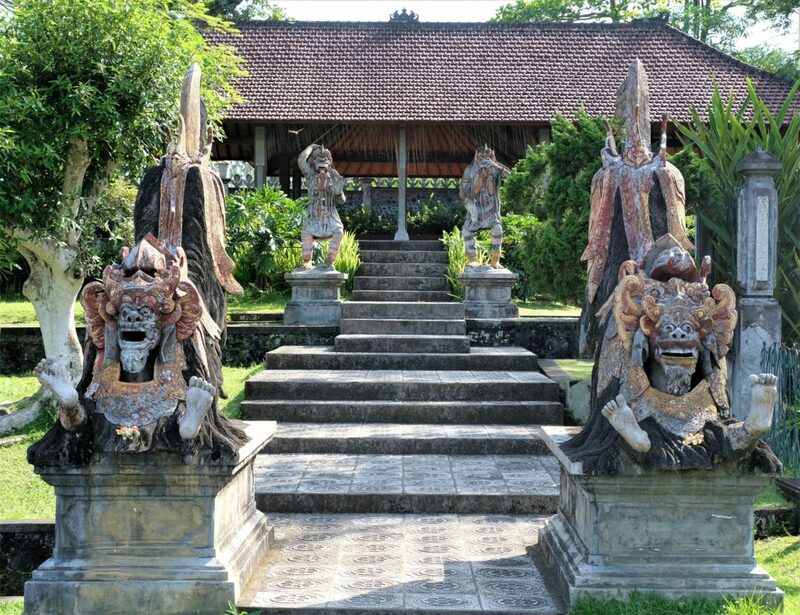 The candi bentar, two wide walls of symmetry with terraced sides narrowing as they go up, their decoration part of their structure; wing like decorations that flare out and upwards almost like questions-marks. 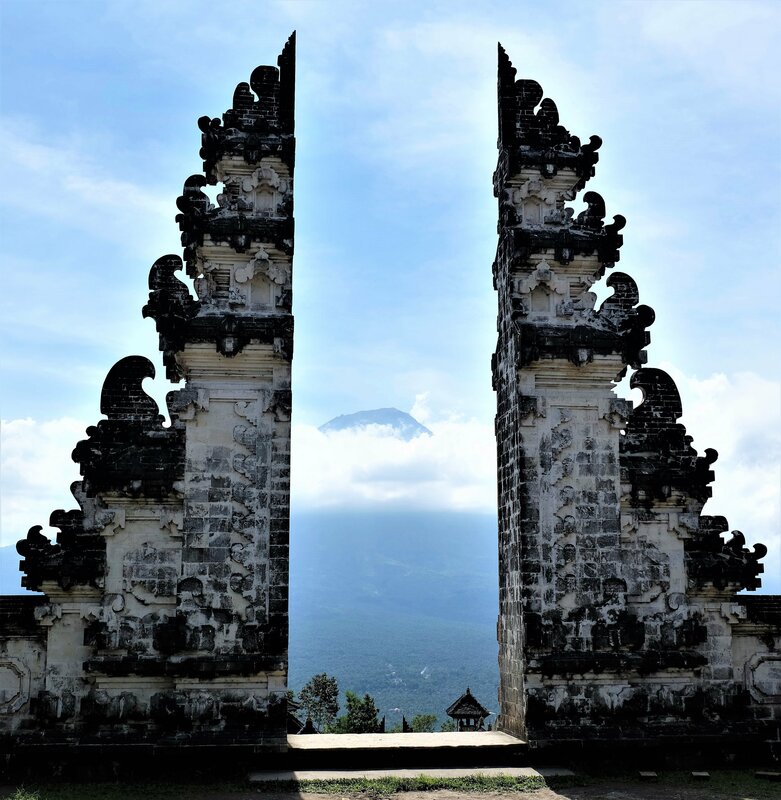 If you turn around this gate perfectly frames Mount Agung in the distance; the largest, and active, volcano on the Bali. 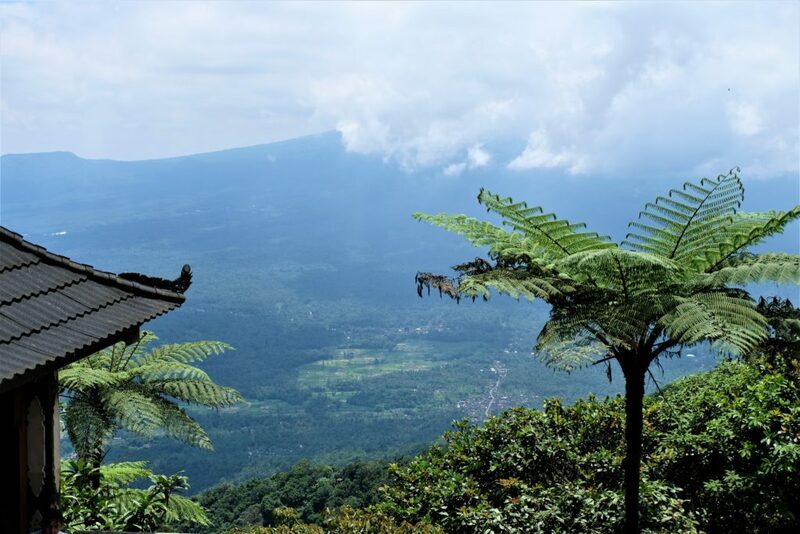 I must admit, I would have liked a better picture, the weather wasn’t, a haziness blanket covering most of the Mount Agung – still a lovely view. 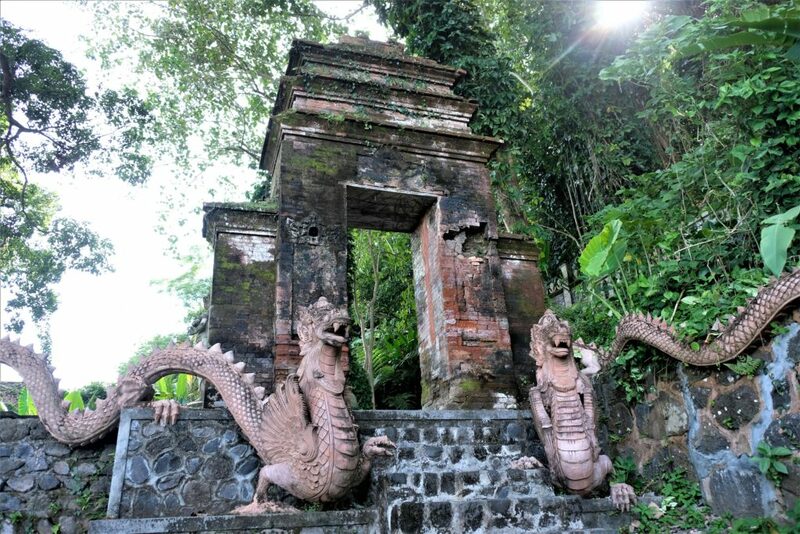 Three sets of stairs fronted by dragon heads as posts lead to the next level of Pura Penataran Agung Lempuyang. 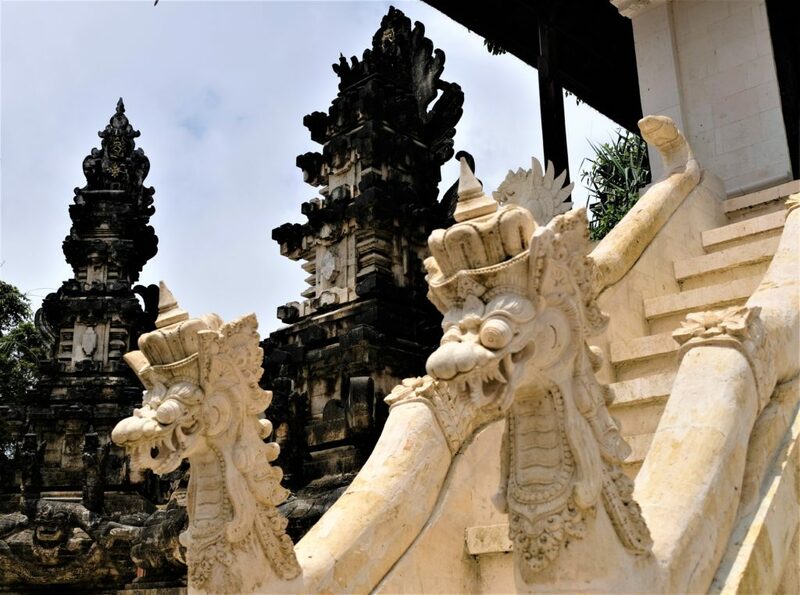 The dragon heads oversized compared to the bodies and make a commanding almost intimidating gateway to the next level with their tails as balustrades in a wave motion leading you up to the next level of the temple. Between the stairs are terraced gardens with statues now worn by time, you cannot avoid thinking you are heading to something, or somewhere important. I was somewhat surprised and underwhelmed at the next level, the sanctuary of the temple. To be fronted by such a grand gateway, then even more grandiose tri-staircase. Puta Penataran Agung Lempuyang’s sanctuary has a few pagoda-like structures, nothing fancy though reasonably intricately decorated. I was expecting a more lavish core of the temple; instead I found something quite understated, if you look for the detailed carvings and brickwork it is there, but still it is subtle. This, the most important part of the temple gives access to everyone, here people connect to whom they pray to. It is a quiet environment, not pompous or stuffy like some institutions yet people naturally speak quietly, it is something that automatically happens even though the wind blowing around makes more noise than people speaking. 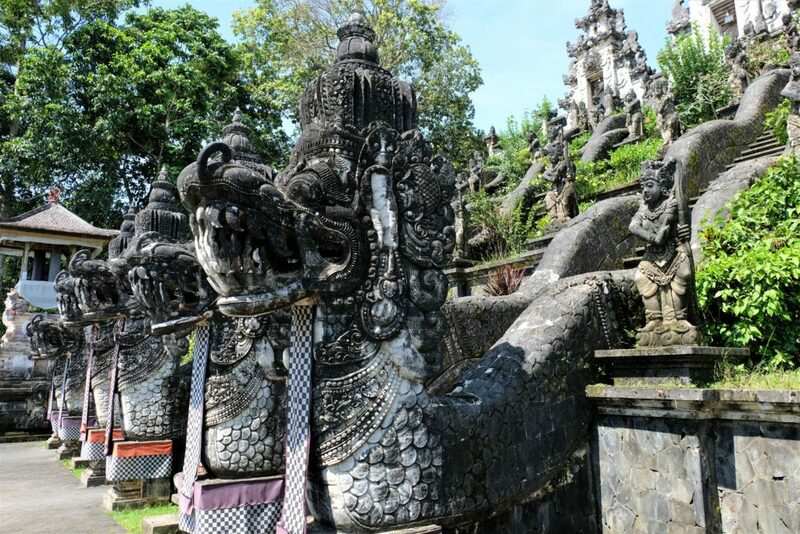 Within this area, knows as the “jero”, which is the most sacred part of the temple. The pagodas, called meru towers and pelinggih shrines are dedicated to different gods or local deities, very similar to many religions dating back thousands of years (reminded me of the temple of Kom Ombo in Egypt). There are also many padmasana shrines, these are look like thrones, they are dedicated to the highest god of the Hindu pantheon e.g. 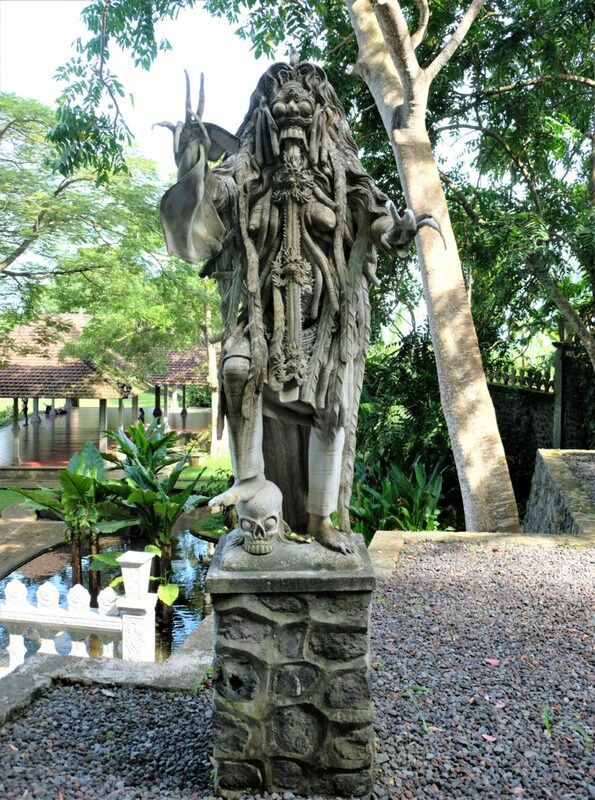 the Sang Hyang Widhi and the gods of the Trimurti – very confusing, I hope I got my explanation correct!?!?! Putting things into perspective, the first temple is 600m from the base of the mountain, the next temple what I was told is knowns as the white temple is just a little further up, the mountain is 1 175m. They were working on the temple when I got there, looks like substantial work, with large parts looking more like a construction site than a temple. I’ve become accustomed to stairs, here up the mountain path was no different. 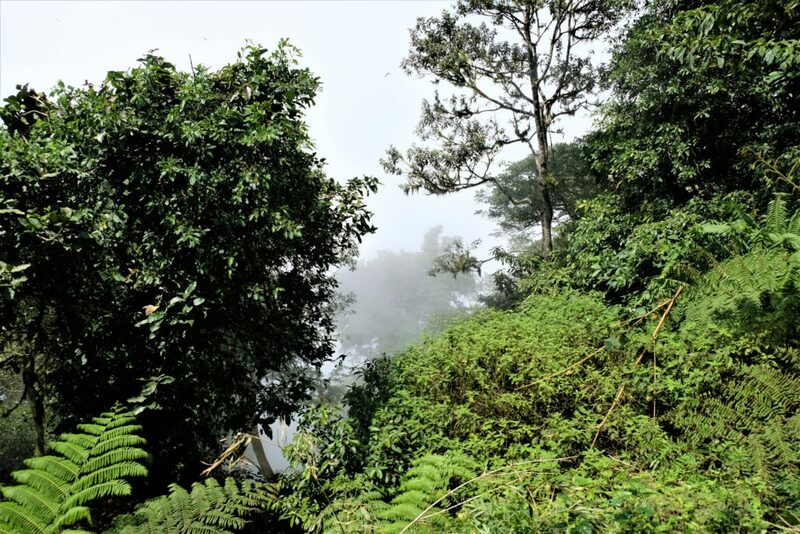 Here, the stairs look like a tunnel with the foliage creating a roof, so you cannot see much else except the stairs leading up the mountain into the jungle. 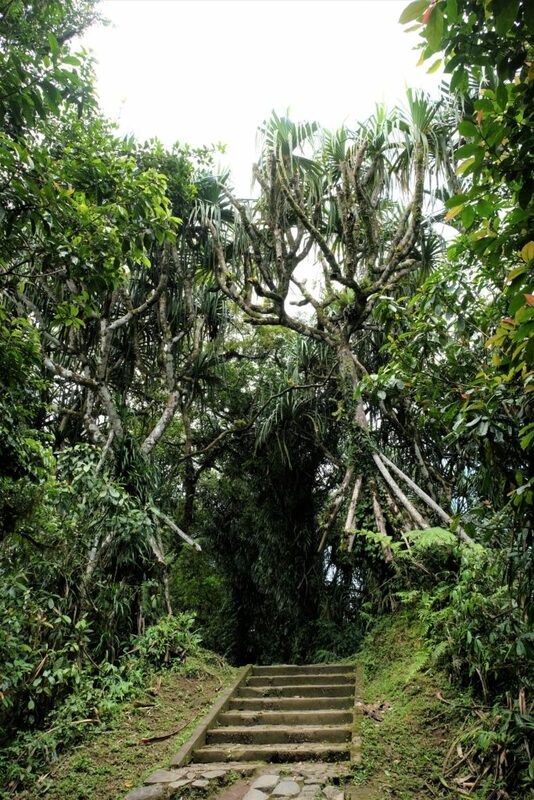 Yes, it was hot and humid, the vegetation preventing any cooling wind getting through, so the walk up is quiet, the only sounds are birds and the occasional monkeys jumping from branch to branch. From the darkened tunnel of jungle, you turn a corner and nearly blinded as the sun reflects of the white stone temple. Very much smaller than the first temple, it is quite a site with almost the entire temple of white stone in a clearing in the middle of nowhere. By small, I mean the entire complex is about the size of a tennis court. As with the first temple, here white dragons form part of the entrance and the spires adorned with flared wings. I was the only visitor there; the rest were builders and a two monks (I don’t know if that is what they are called). I hadn’t planned on staying there long, there isn’t much to see except something caught my ear, a noise coming from a plastic water bottle at the base of a shrine. At first, I thought my eyes were deceiving me, no, there was a little bird inside the bottle!?! Too big to have go inside by mistake. It was flapping its wings and chirping distressingly then it would be quiet for a bit, then repeating its anxious behaviour. I looked at the monk and pointed at the bird, he smiled back in an agreeable manner, almost proud. I went to take the bottle and was promptly and sternly gesticulated at to leave it alone. My look of disbelief couldn’t have been misunderstood, the monk/guard moved closer to the shrine and stood between me an it, I shook my head and walked off. I continued up the stairs in robot fashion, my mind consumed by the bird in the bottle. 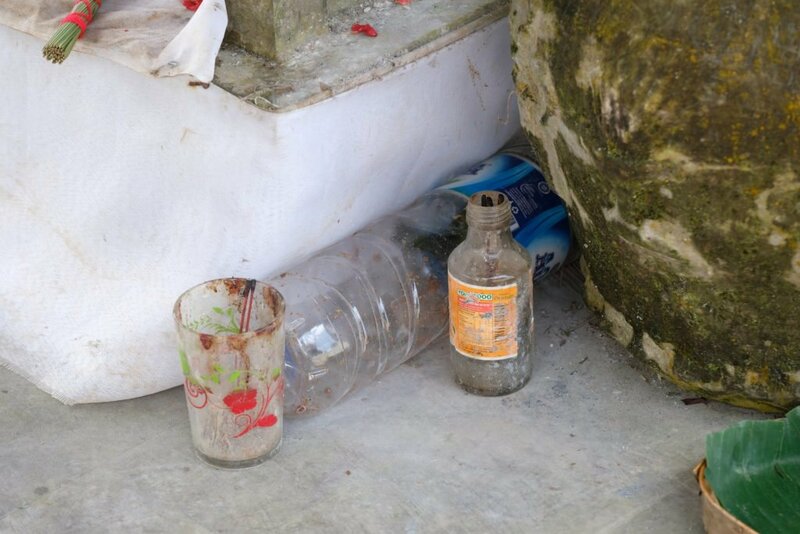 What a disparity between the Balinese people who were all friendly and seemed peaceful and thinking trapping a bird inside a bottle is acceptable!? Travelling has been an amazing learning experience, my mantra of learn, explore and expand your being has been something I have actively tried to do where ever I’ve been (sometimes more successfully than others), but what was there to learn about such cruelty? It is not a criticism of any religion (I’ve kept my thought of religion intentionally out of my blog), but this sort of thing I cannot condone under any circumstances, frankly I don’t care what the reasoning is to be so cruel to an animal. My regret about leaving the bird was that I should have put more effort into trying to free it, put up a fight for the poor bird – what’s the worst thing that could have happened, they could have thrown me out of the country (very doubtful), likely just the mountain. At least then I could have slept well, it bothered me for days and still when I look at the picture I get angry and disappointed with myself. I carried on up the mountain, shacking my head to myself, not my finest moment, one I will not deal with in the same manner should a similar situation arise. A person will not always agree with colloquialisms, some shouldn’t be. Onwards and upwards, literally. 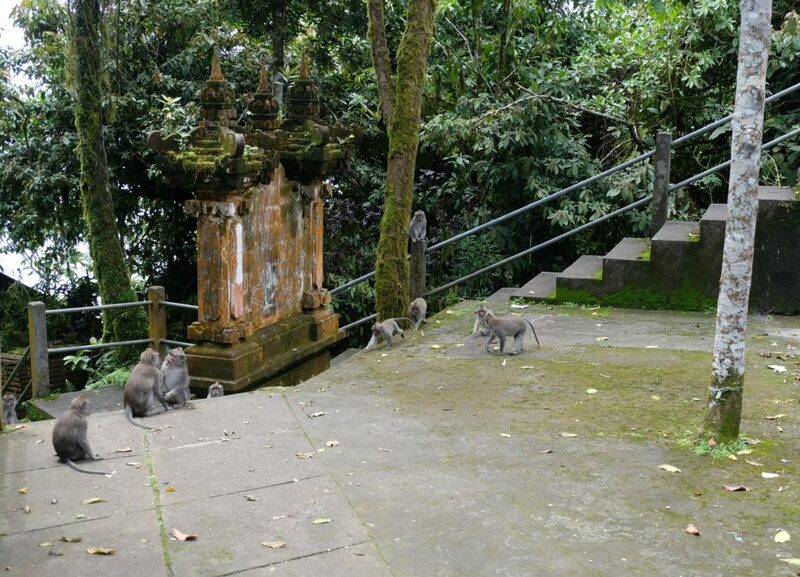 As I ascended the temperature cooled with a noticeable increase in the number of monkeys, finally arriving at Pura Lempuyang Luhur right at the top of the mountain, 1 175m. Expecting panoramic views of the valleys below with Mount Agung in the distance…nope, the clouds had moved in, visibility was no more than 20-30m. I was a tad disappointed nonetheless enjoyed the hike up the mountain, the last bit to Pura Lempuyang Luhur though distracted in my thoughts was good exercise. 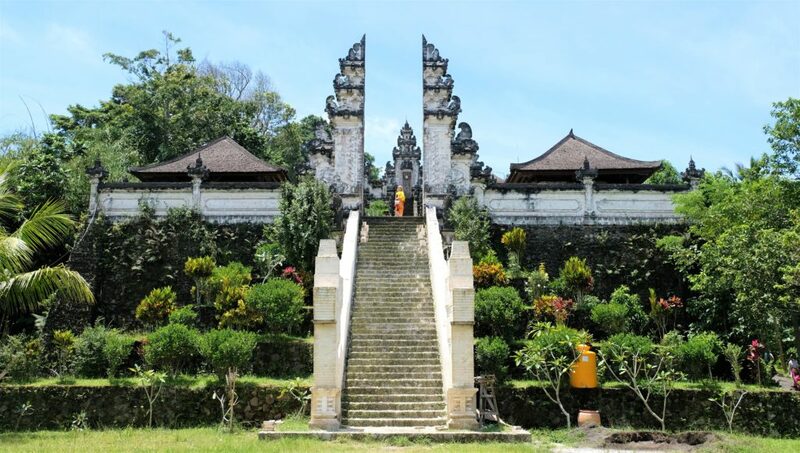 The actual temple itself felt a little neglected, it is one of the oldest temples in Bali and highly revered. Proceeding the entrance to the complex there are a few market stalls, mostly selling refreshments and a little food for the weary tourist and pilgrims. You can also buy offerings for the temple/shrines along with food for the monkeys. There must be near 100 monkeys at the temple, not aggressive, more so confident and assured, not easily chased away if they think they can get some food from you. They seem to keep the temple monks/priest/guards busy, a find balance at stopping them from taking offerings away from the shrines… feat I do not see them winning against the persistent and clever monkeys 😊! 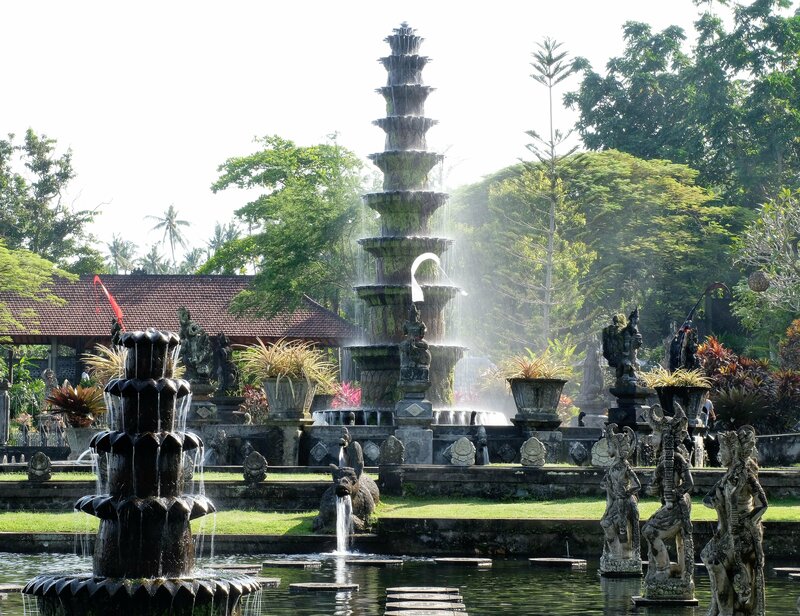 The second part of the day was visiting Tirta Gangga, often referred to as the Water Palace, what a beautiful oasis it is. 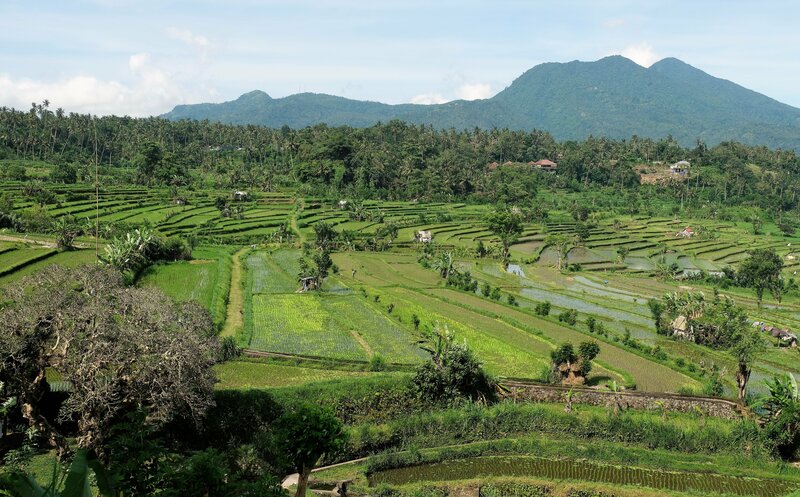 Even the area surrounding the palace is picture perfect; valleys of rice paddies between natural forest and Mount Lempuyang pointing out in the background. The lines between the rice paddies flowing naturally along the contours of the hills, accentuating the flow of the valley. 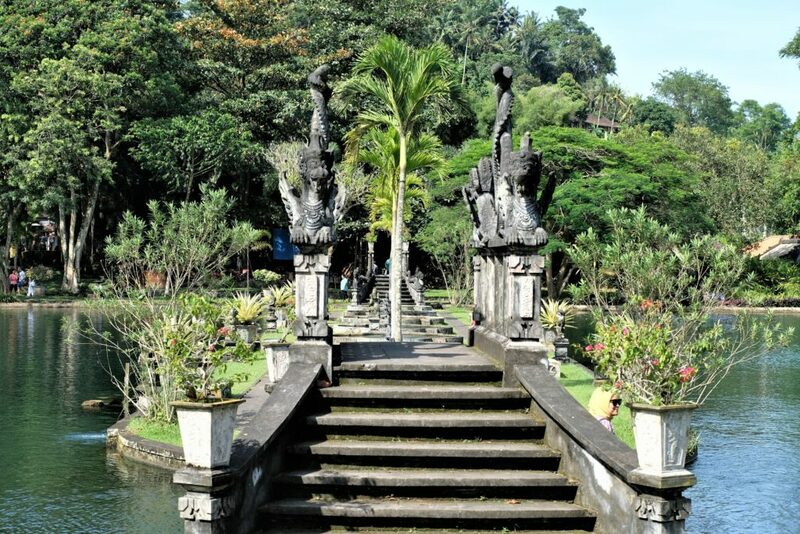 Built in 1948 by the Raja of Karangasem, Anak Agung Agung Anglurah Ketut Karangasem, whom I believe abdicated in 1950, his son took over the title (don’t know how accurate this is). 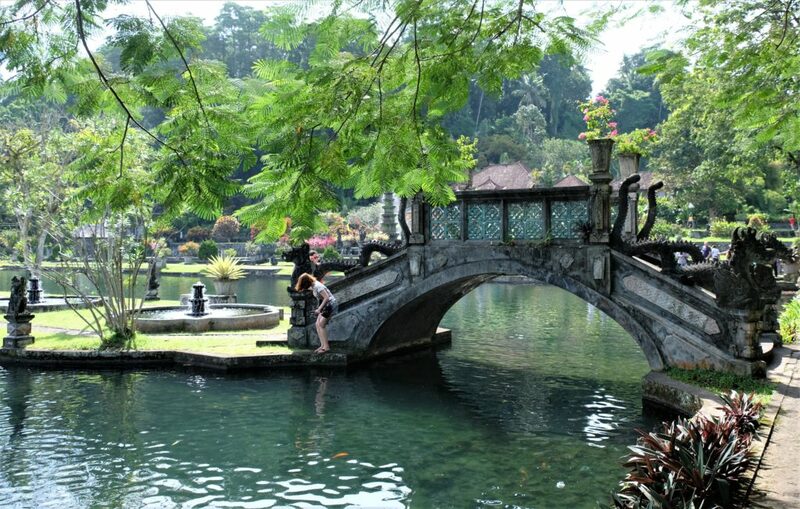 Tirta Gangga (which is the name of the town too) feels like a mixture of temple, monastery, secluded retreat and sanctuary surrounded by jungle, though now quite close to a main road; main road for Bali standards. 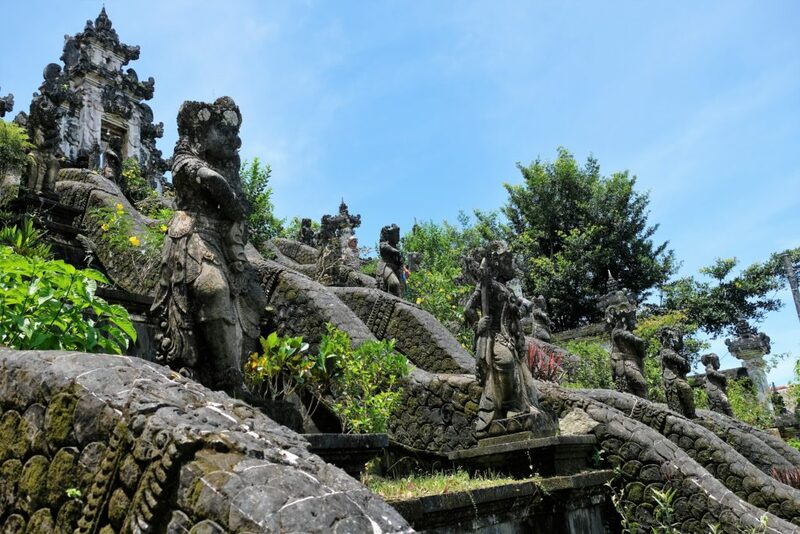 Bali has a history of kings/Rajas dating back to the 10th century till the 20th, till it became a republic in 1950, the royal household/lineage not only of Bali but of others within Indonesia are not recognised as being royal. Though it is (was) a palace and I doubt any costs were spared, it doesn’t have an ostentatious air about it at all. On the contrary, walking about the fish filled ponds, fountains and features I can only imagine this place was built as a get-away; a sanctuary where were it not for all the tourists you could ponder about life and distance yourself from any annoyances clouding your mind. 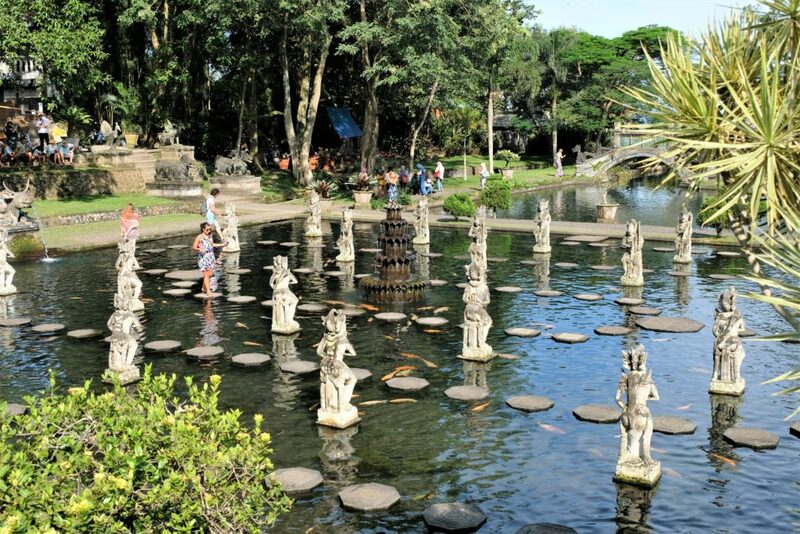 The Water Palaces is both pretty and tranquil, filled with interesting (and some disturbing looking) statues. Walking about you can easily enjoy the environment without being distracted by the attention to detail throughout. Whether it was part of the original design, I would imagine so, the walkways take you around, over and onto the water (stepping stones) making you interact with the surroundings. 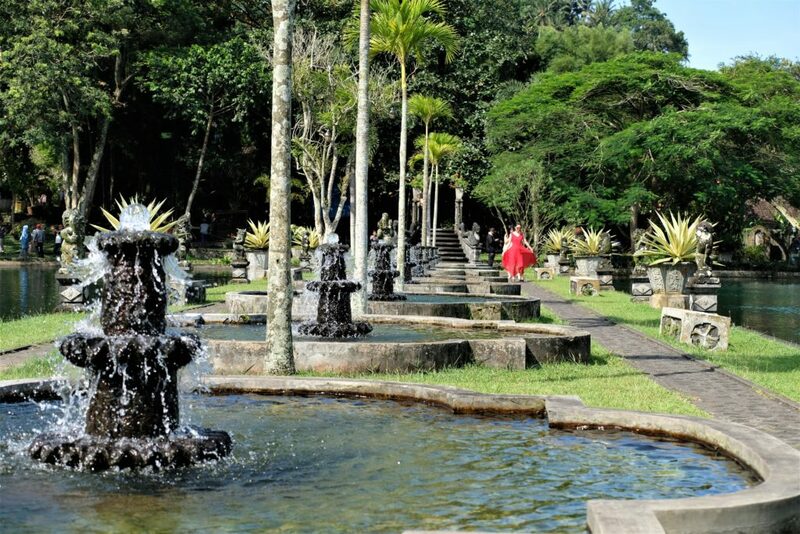 This is a palace not just “for show”, it is a place created to wonder around, dip your feet into the cool water, let the fountain’s spray mist onto your face and when in need for quiet contemplation rest in the many secluded niches in the periphery. There is something I really liked about the Water Palace, it touched a nerve inside, I could have stayed for hours. Not to repeat myself, but I will, I do love water; the refreshing sound of streams, rivers or in this case fountains and water features. Such sounds make me relax, the flurrying water is like watching a flame, it’s hypnotic; I find myself drifting off into thought, life’s worries floating down a river like a paper boat, something we did when I was a child – those are great memories. Hmmm a combination of the lost photos and weather meant my time in Amed Beach wasn’t as productive as I had hoped, especially the snorkelling, hey ho such is life. Despite this I thoroughly enjoyed my time there. I was still in Amed Beach during Nyepi or Day of Silence, now, if there was ever a fantastic idea/ethos to have a bank/public holiday then “Day of Silence” is worth it. During Nyepi, which is a Balinese day for silence, fasting and mediation. Everything shuts down, I mean everything, no cars or motorbikes are allowed on the road unless it’s an emergency. You are not allowed on the beach let alone in the sea – the police patrol the beaches and you will be fined if caught. No radios or TVs are played, even the lights throughout the accommodation complex are turned off (except those inside the bungalow). Even talking is kept to a bare minimum and when done it is at a whisper. You cannot escape the silence, it catches up on you, you can only pretend for so long that you cannot hear it until it consumes you like a giant wave. The deafening silence forces you to slow down, automatically reflect on what’s around you and life in general. Without the white-noise that surrounds us throughout our daily lives it makes it so much easier to focus and notice what surrounds us. From the smallest things like insect noises, birds, the wind, rustling trees to the sound of the world. So, that was my short time in Bali. Bali started off on the rocky side for me but ended very well, a special thanks to Amed Beach and surrounding areas. No fireworks yet I enjoyed it with some lessons learnt along the way, which can only be a good thing. I’d like to go back and explore the rest of the island, away from Kuta beach and would love to climb Mount Agung. Next stop would be Gili Air, one of the three Gili Islands just off the North West coast of Lombok where I would head after Gili Air. Bit of a long blog post, I hope it has not bored you to read!